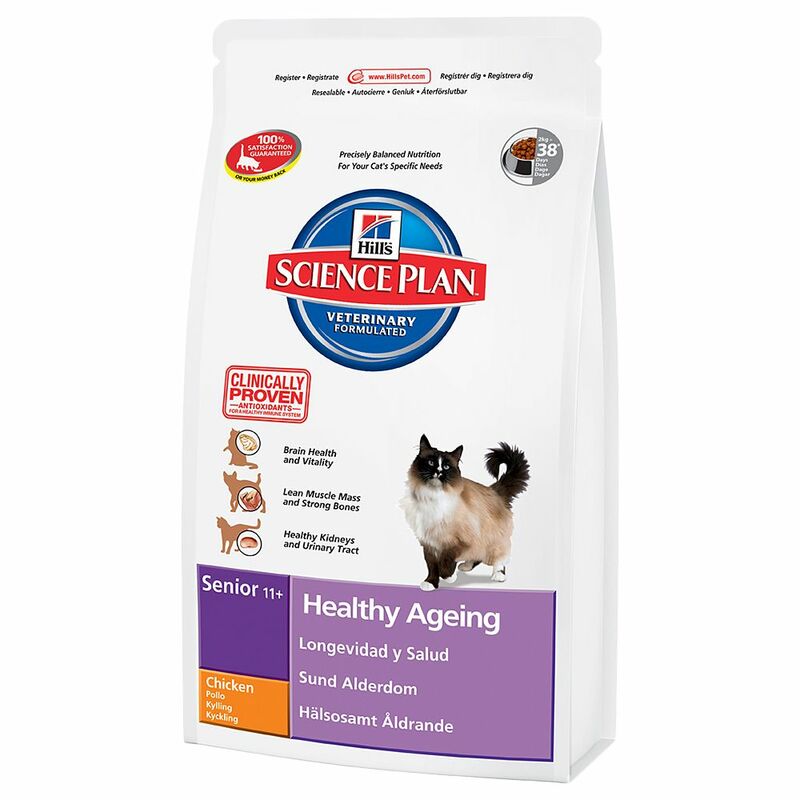 Hills Feline Senior Healthy Ageing 11plus dry food has been specially formulated to provide a nutritionally balanced and holistic solution to meet the specific needs of cats aged 11 years and over. The unique combination of functional and healthy ingredients can help to combat ageing changes and offers a complete kibble with all the eΒential nutrients, vitamins, minerals and proteins that older cats need for good health. As cats get older, they get leΒ enjoyment from movement, and so their levels of activity decrease. Their metabolism slows down and their immune systems can weaken. If their nutrition is not adjusted to their changing needs, they can become overweight, which in turn can lead to heart, respiratory, urinary and joint problems. Kidney disease is also a typical medical condition aΒociated with your cat getting older. Powerful antioxidants protect cells and help to combat the ageing proceΒ, support the immune system and guard against free radicals. The product also contains omega-3 fatty acids, for a sleeker coat and healthier skin. They can also help to preserve cognitive function. L-carnitine works against exceΒ weight and can also help to prevent weight gain, as it stimulates the conversion of fat into energy and can reduce body fat deposits. Hills Feline Senior Healthy Ageing 11plus has a reduced mineral content to support the health of the urinary tract and kidneys. This food even appeals to picky seniors, due to its superb taste. The special shape and texture of the kibble helps to clean your cat's teeth whilst it chews. Hills Feline Senior Healthy Ageing 11plus dry cat food at a glance: Specially formulated for cats aged 11plus A balanced formulation targeted at the specific nutritional needs of older cats Antioxidants: To protect against free radicals, and can also help to strengthen the immune system and work against the effects of ageing. Omega-3 fatty acids:To preserve cognitive ability and for healthy skin and coat. Urinary tract and kidney function: Reduced mineral content can help to prevent struvite stones and keep kidneys healthy. L-Carnitine: Can promote the conversion of fat into energy and reduce body fat deposits, to maintain lean muscle and prevent weight gain. High acceptability: Even appeals to picky eaters thanks to its excellent taste. Price just £76.99! Click here to buy now!